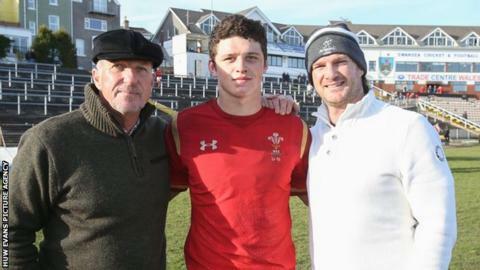 When James Botham signed his first senior contract with Cardiff Blues on Wednesday, he became the third generation of his family to play professional sport. The former Wales Under-20s international's father, Liam Botham, also played rugby union - on the wing for Cardiff RFC, the Blues' predecessors - as well as rugby league for teams such as Leeds Rhinos, having started his sporting career as a cricketer with Hampshire. Playing three sports is impressive, but Liam is not even the most famous athlete in his family. That accolade goes to his father and James' grandfather, the England cricket legend Sir Ian Botham, who for good measure, also found time to play league football for Scunthorpe United during his career as one of the world's greatest cricketers. The Bothams are a rare breed in sport - a family with three generations all playing at an elite level - but, as some of the examples below demonstrate, they are not the only ones. Marcos Alonso is a name which has appeared intermittently in line-ups of Spain's national football team since 1955. The current model - full name Marcos Alonso Mendoza - has earned three caps for Spain during a career which started at Real Madrid and, via spells at Bolton and Fiorentina, has taken him to Chelsea, where he won the Premier League in 2017. The left-back made his senior international debut in 2018 and, in doing so, followed in the footsteps of his father and grandfather, both capped by Spain and both called Marcos Alonso. His father - full name Marcos Alonso Pena, but known simply as Marcos - enjoyed a long and successful club career, most notably with Barcelona and Atletico Madrid. He also won 22 caps for Spain, helping them reach the Euro 1984 final. And it was his father - the current Chelsea full-back's grandfather - who was the first of the family to gain international recognition. Marcos Alonso Imaz, nicknamed, Marquitos, earned the first of two caps for Spain in 1955, but it was his club career for which the defender, who died in 2012, is best remembered. Marquitos was a part of the famous Real Madrid side which won five successive European Cups between 1956 and 1960, as well as five La Liga titles between 1955 and 1962. Cricket is a sport with more than its fair share of family dynasties, but the Headleys are the only family to provide three generations of Test players. The first was Panama-born George, who moved to Jamaica aged 10 and earned the nickname 'the black Bradman' as he was regarded as the first great batsman to emerge from the Caribbean. He scored 176 on his Test debut for the West Indies against England in 1930 and, in a career punctuated by the war, scored 10 centuries in just 22 Tests at an average of 60. His son, Ron, was a talented batsman, but not on the same scale as his father, spending the majority of his career playing domestic cricket for Worcestershire before earning two Test caps for the West Indies at the age of 34. With Ron and his family settled in Worcestershire, his son Dean made his name as a fast bowler in England, establishing himself with Kent before playing in 15 Tests and 13 One-Day Internationals for England. There are three families who have provided three generations of players in American football's NFL, and the first was the Matthews clan. Clay Matthews Senior started the legacy, playing four seasons as a defensive end and defensive tackle for the San Francisco 49ers between 1950 and 1955 in the NFL. His two sons followed his lead by both playing in the NFL, Clay Matthews Junior for the Cleveland Browns and Atlanta Falcons, and then Bruce for Houston/Tennessee Oilers/Tennessee Titans, earning him a place in the Pro Football Hall of Fame in 2007. There then followed a third generation, which includes current Green Bay Packers outside linebacker Clay Matthews III, former Philadelphia Eagle Casey Matthews, ex-Tennessee Titan Kevin Matthews, Mike Matthews, once of the Cleveland Browns, and Jake Matthews, who has been with the Atlanta Falcons since 2014. The surname Cowdrey has a long and distinguished association with English cricket. Colin Cowdrey amassed 7,624 runs during his 114 Tests for England - 27 of which were as captain - and his son Chris also led his country once during his six Tests. Both enjoyed illustrious careers with Kent as well, with Colin captaining the county from 1957 to 1971, while Chris played 300 first-class games for them between 1977 and 1992. Then in 2012, Chris' son, Fabian Cowdrey, made history by becoming the third generation of his family to represent the county. Cesare Maldini was a towering figure of Italian football, a defender who won four Serie A league titles and a European Cup with Milan. He also won 14 caps for Italy before embarking on a managerial career which saw him take charge of Milan and the Italian national team. Despite those credentials, however, it is his son Paolo who most people think of when the surname Maldini is mentioned. Equally accomplished at left-back or centre-back, Paolo was an influential figure in several Milan sides, helping the Rossoneri win seven Serie A titles and five European Cups. A one-club man who spent 24 distinguished years as a Milan player, Paolo holds the Serie A record for most appearances with 647 and won 126 caps for Italy, reaching the finals of the 1994 World Cup and Euro 2000. Paolo's son, Christian, did not make the grade at Milan, but is still playing professionally for Fano in Italy's third tier. And there could be another Maldini on the scene soon, with Paolo's other son, 17-year-old Daniel, earning glowing reviews as he progresses through the youth ranks at Milan. Can you think of other multi-generational sporting families? Submit your ideas in the comments section.